I know I've been lazy in the last six (ok, even more) months... but things have changed around my career a little bit. Don't get me wrong, I am still doing lots of SharePoint stuff, but since last summer I also got involved in some Power BI projects. I've also started putting up a another small blog on Facebook related to my other passion, which is globetrotting. 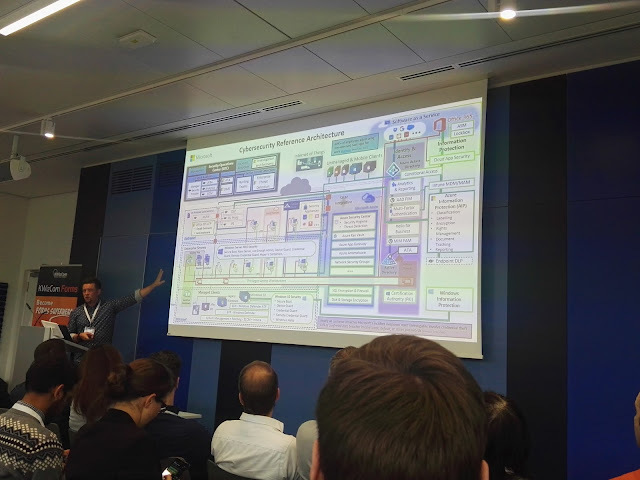 I got really good insights in the Power BI technology during a full day workshop at the European Collaboration Summit in Zagreb, Croatia last year. Thanks to John White and Jason Himmelstein for the wonderful delivery of the content. It was transferred to hands-on experience starting the day I got back to work. In the last 9 months, I've got my hands dirty and designed several solutions, based on Power BI reports and dashboards, with data from SharePoint, Exchange Online and other business applications. It was the toughest exam I've taken (no kidding! ), there were a lot of DAX queries and a mix of admin and developer questions...it was a close one with a passing score of just 745. Anyway, I wanted to give you some value with this post by telling you about a feature that got released in Power BI Desktop recently... that's the Q & A. Even on the exam, questions to Q & A referred only to the dashboards in the Power BI service, but this feature is now also available in the reports in Power BI Desktop. Your Power BI desktop client must be at least the December 2017 version... but I recommend you get the March 2018 update. It's a preview feature, so you'd need to enable it first. You can do that by going to File -> Options and settings -> Options -> Preview features. Tick the Q &A feature, click OK and restart Power BI desktop. For example, I'll load a dataset of Projects and ask the simple questions.. ok how many are they? Rather than doing a COUNT function with DAX... and boom: I've got the answer. Now, sometimes, you will not know the exact field name by which to search... let's say you insert a query for top client by revenue, but the field in the dataset is called customer. Here's where the synonyms come into play. I will write another post on how to get the most of those. 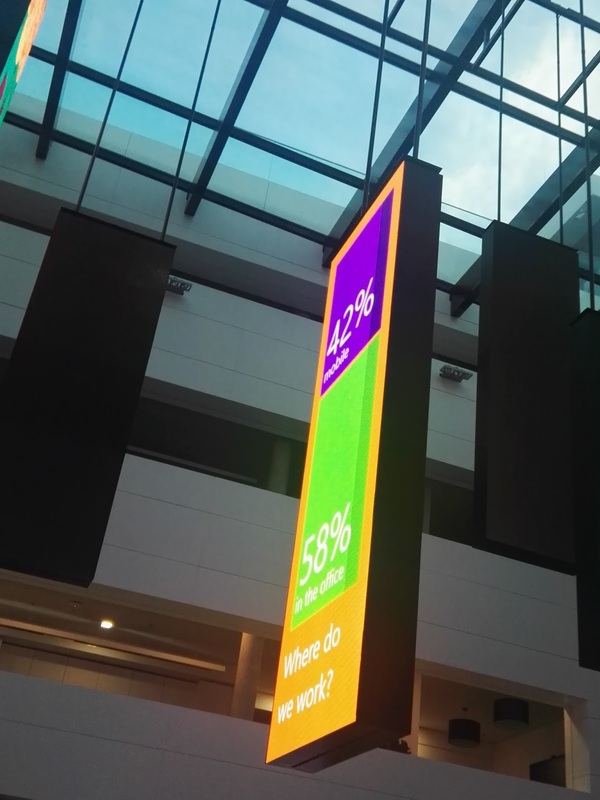 So... how many of you are using Power BI? Are there any of you interested on taking the exam? So.. some good news for the majority of people. This scope of this post is all about SharePoint Online. The most popular browser in the world nowadays is Chrome... and we've had the pain of not being able to use the "Export to Excel" functionality on SharePoint lists for a while... I've even implemented HTML buttons in CEWP in order for people to download a pre-saved .iqy file and get the same functionality in any browser. From last week, the OOB button on the ribbon seems to work fine in Chrome! It also works in FireFox (not sure since when) and IE and Edge had this working traditionally. The Open with Project button that was working fine in any browser traditionally...now doesn't work. In any browser. So the only way to open your Project (.mpp) files that are synced to SharePoint task list is to go to Site Contents -> Site Assests and then open the file from there. Calculated fields with HTML in SharePoint Online lists are GONE. Updated 15/09/2017: This feature has been extended up to 28/02/2018. So today I just found out that many of the lists that I've created for Projects, task lists etc. have gotten pretty bad looks. I mean... BAD. This # field should be displaying the color background of the task number, according to the task status...NOT today. I've also used this to display website links in a pretty way, as well as some traffic lights for project statuses. Then I stumped onto this message in the tenant's Office 365 Message Center. 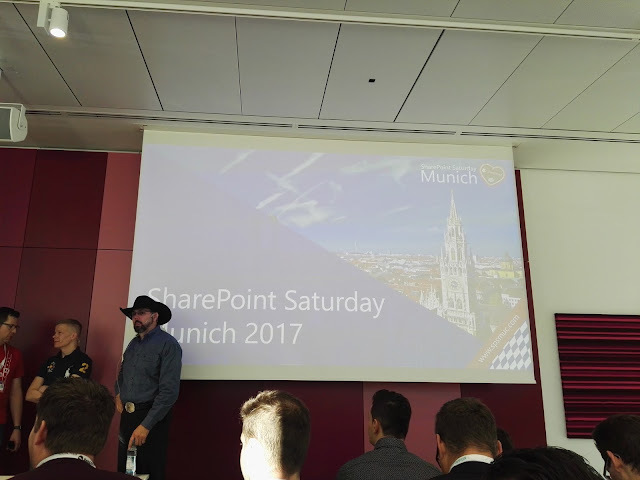 SharePoint Saturday Munich 2017 Day 2: The Conference! 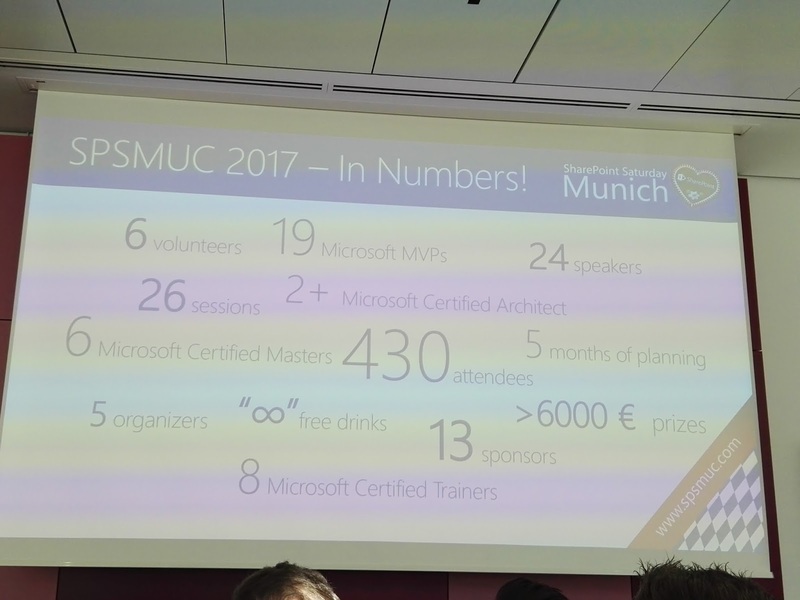 You can read a short introduction about SPS Munich and the pre-conference workshops that took place on the previous day in my last post. We went to the conference at around 8:30 and the atrium was already full of people. We were met by Mathias Einig who organizes the SPS Munich and SPS Stockholm events and he gave us the tip to quickly get into the Keynote room as it was expected to get packed. It did. The room was full and there were 3 more rooms that had been watching the keynote on big screens. 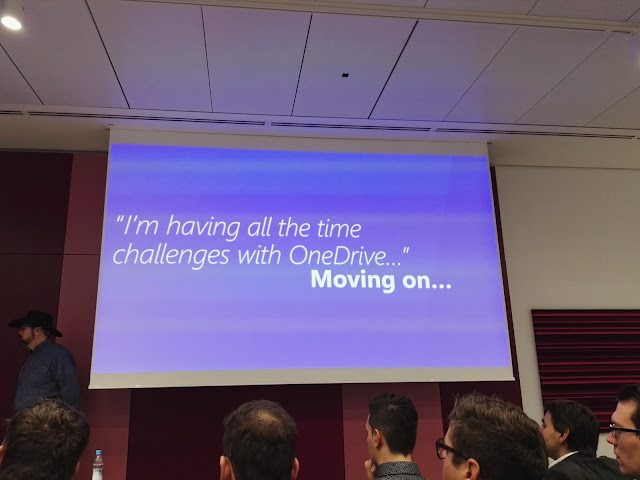 - OneDrive single client for syncing both SharePoint document libraries & OneDrive will soon be a reality (in fact there is a TeamSiteSyncPreview.reg which you can download and already sync SharePoint document libraries. - SharePoint Framework will be the future model for SharePoint development. Skills needed would match those of a regular web developer, so the possible career path for SharePoint developers would be more interesting and flexible. - There will be another (maybe even two) on-premise version of SharePoint Server. - SharePoint Product Engineering is aiming to shorten the release cycle from 3 years to small incremental releases, so that the users can get more feedback in the process. And oh boy, they did get feedback as Vesa said. Last but not least, we've had lots of laughing in the hall. Well done, Vesa and Eric! A little bit of impressive statistics shown by Mathias. 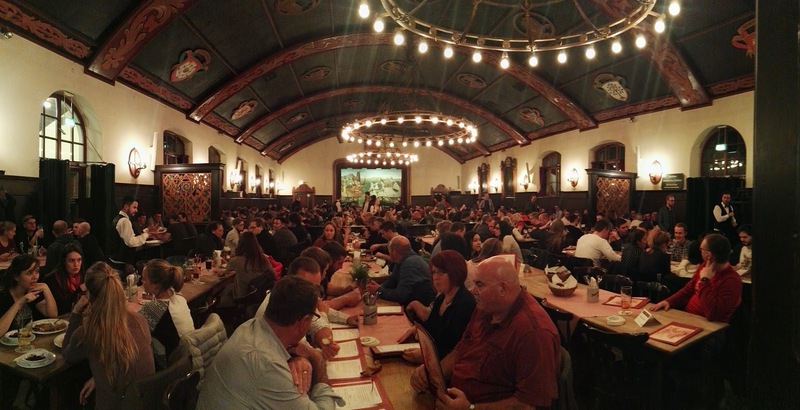 With 430 attendees, I think that was the biggest SharePoint Saturday ever? I bet it is the biggest in Europe and the best one held so far. The event was in fact international with all sessions held in English and people from all over Europe and even the US! 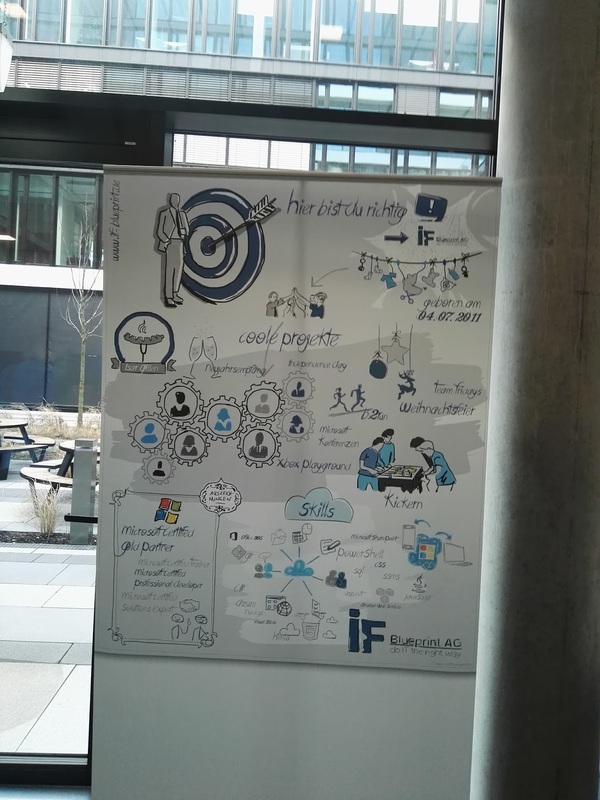 Meanwhile, at the coffee area, there was this really cool poster by IF-Blueprint AG who were volunteers at the event. Cheers to the person or team who worked on it, it's really cool! - Navigating through the schedule and modifying it on the go. 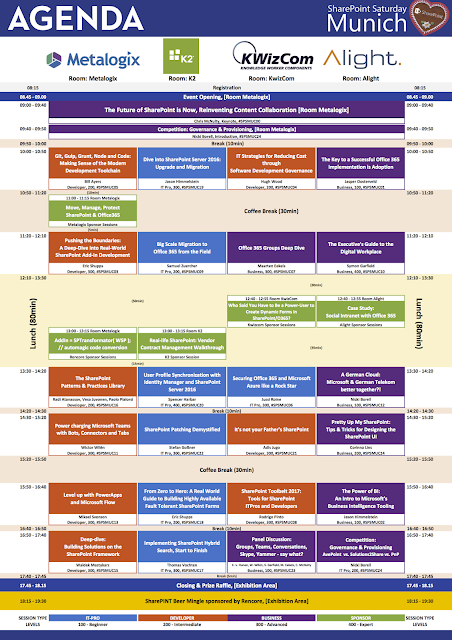 I've changed my mind for one of the sessions on the day. - Rating the sessions - there was even a section for comments. - Networking with other SharePointers. I've got a message from another Bulgarian whom I didn't know before the conference, but we were in the same room. - Photo Contest :) Even though we've posted some pics, I think the organizers missed that one partly because there were so many things going on at the same time! But this is not a critic in any way. It was fun, at least to see what people would post in terms of interesting pictures from the event. There was a printed agenda as a bag insert, too, it was also useful. I liked the looks of it, so I'll share the picture here (it's from the official SPS Munich site). 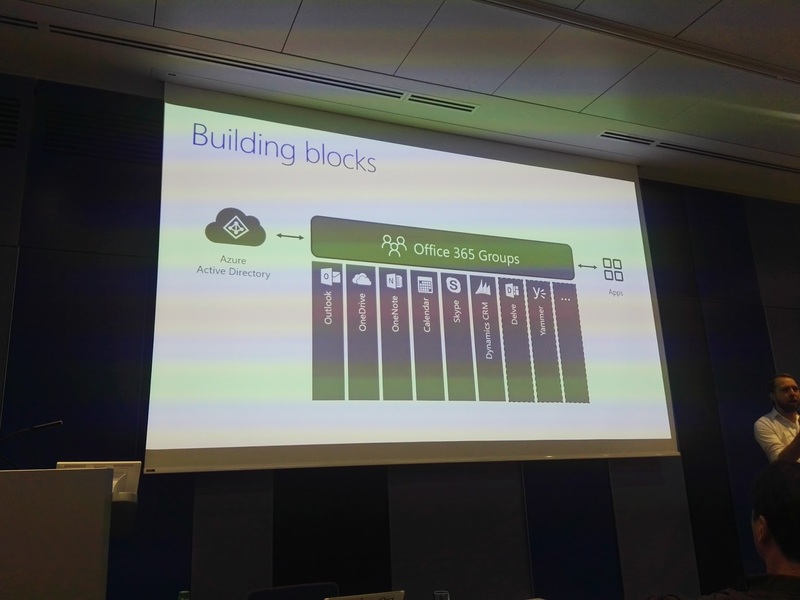 The #spsmuc20 session with Spencer Harbar got replaced with Paul Hunt's Exploring Identity Management Options in O365 as Spencer couldn't make it to the conference, but it wasn't on my agenda anyway. 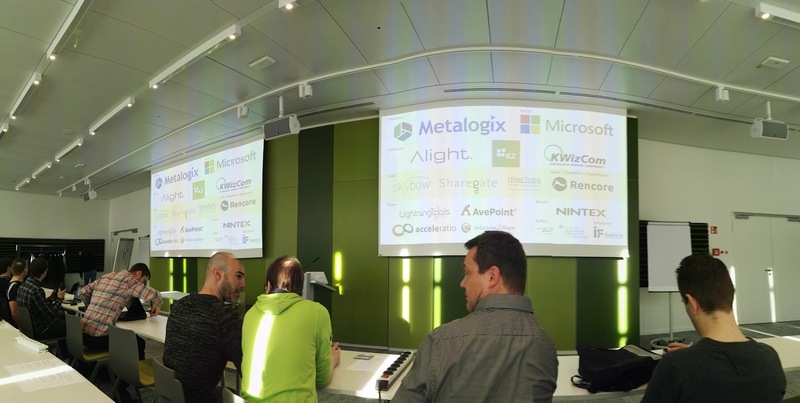 Move, Manage, Protect SharePoint & Office 365 - sponsored session by Metalogix. #SPSMUC23 - Panel Discussion: Groups, Teams, Conversations, Skype, Yammer - say what? 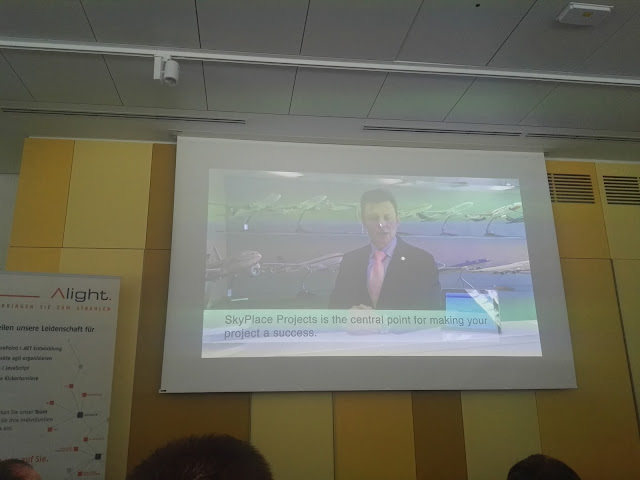 One of the case studies I found very interesting - a video with the key stakeholder. 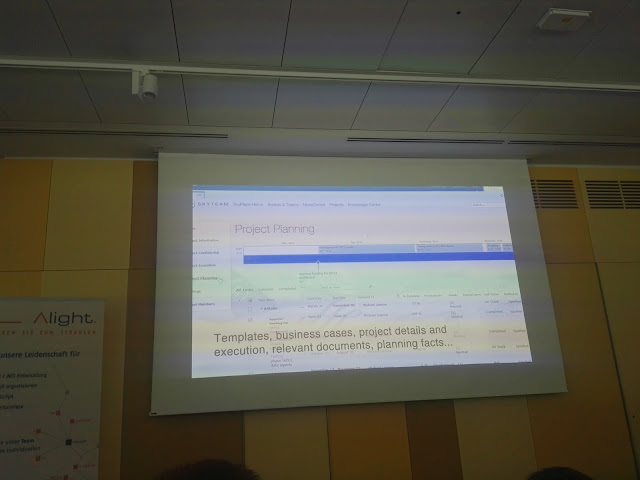 The project was a simple Project Management solution in SharePoint, one you've probably designed in a few days - it looked like the default columns in a Task list, then a very simple branding, BUT the key was the way it was presented. With a video with the key stakeholder - I think a VP of Information Technology or something similar. Video still... it made me wonder how many times I've seen projects fail because of poor communication / presentation / a little bit of PR. 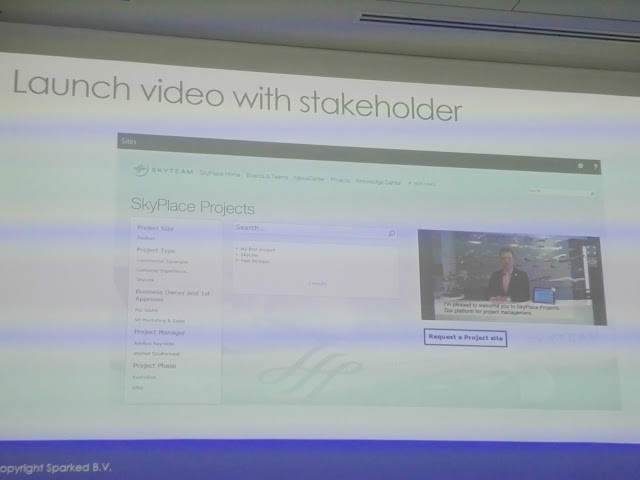 Jasper also used the introduction of Microsoft Teams by Satya Nadella as an example, how Microsoft are bringing "the big guns" when introducing something new. - Have vision & goals. - Have an executive sponsor. - Have a budget for adoption (it's not free). - Know your target audience. - Make a launch party (everyone loves to have some fun at work). - Think about a video with the project sponsor if you have virtual teams. - Train your users by doing quick 1-2 min videos frequently (think of hiring a voice actor to make your videos more professional). - Train users in person if that's the style of working in your organization (don't make groups larger than 10-15 people and don't do it alone as you won't be able to handle all the incoming questions). - Train the trainers (especially valid if you're an external consultant and you're not going to be around for long in the organization). - Have Office 365 champions (definitely try to get those people from different departments). - Set a baseline and success criteria. You can use the OOB O365 Reports to measure the success once you launch - you'd need to be an administrator of the O365 tenant to access those. - Use the First Release cycle for selected power users in your organization. Keep in mind they must be curious and play with the new features so that you get feedback from them. - Office 365 is going fast! Go to conferences & events, just like SPS Munich :) to stay up-to-date. Hands down, the session was above my expectations. Even though just a level 100, I got some useful insights which I'll use into practice. Crappy sponsored session. Slides in German!? The speaker said he gets a bit uneasy in front of people (?!) A good question that was asked at the end about the licensing model for calculation could not be answered. Got redirected to account managers. So where were the account managers instead of in the room? Although I am certified on Metalogix Content Matrix and I've used their software for a large-scale migration for a customer 2 years ago, I honestly think they could do better. Anyway, thank you Metalogix for being SPS Munich's only diamond sponsor! Instead of this session, I was planning to go to a level 400 Business (?) session: #SPSMUC10: The Executive's Guide to the Digital Workplace and I am so glad I didn't go there! - Connectors - those are also available in Teams and there are more than a 100 of them already. You can build your own by creating an incoming webhook and then send requests to it from any web service (this was demoed with Postman - a very handy tool which I was not aware of, so thanks Maarten). 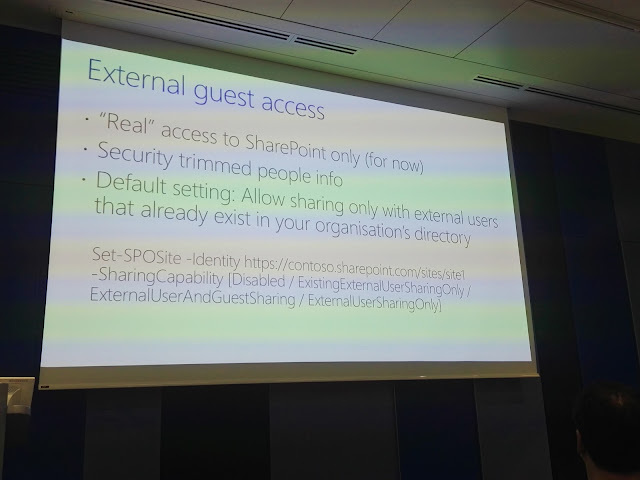 - External guest access - right now the only part that's available to external users is the modern team site. Teams do not have external access just yet, but it's on the roadmap. - Manageability - mixed feelings story. Groups are managed from so many different places - O365 Admin Center, Exchange Admin Center, the Outlook (?) Groups mobile app, PowerShell...with the latest being the greatest. We've had a pretty good lunch, this day it was a menu with predefined options, but again, hands down for the food. I will not fill this blog post with pictures as they're too much already, you just have to trust me! 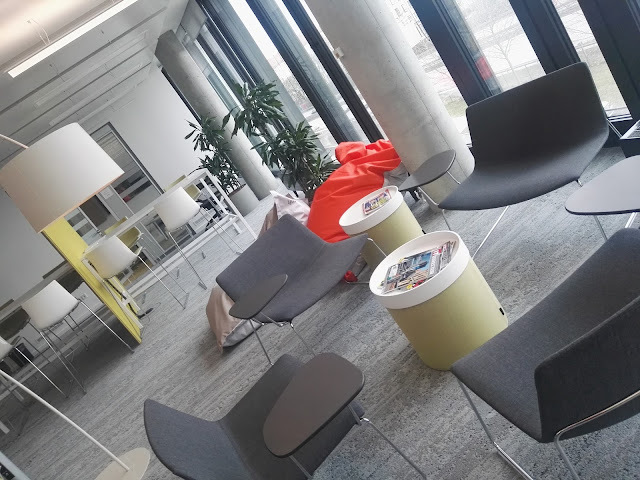 It was awesome and we've had plenty of time (80 min) for lunch (there were some sponsored sessions going on during lunch time too) and in that time we've managed to get a tour of the brand new Microsoft DE HQ office. There were 5 groups for the day (10-11 people) and the previous group was already full, so this time we went 15 min ahead of time. To be honest I don't have much experience with Azure and the security in it, I've just used MFA in Office 365. But Jussi's session was really insightful and I'm surprised he managed to stick it into 50 minutes. - Azure Active Directory is at the heart of security, just like the good old AD is on-premise. - You can discover unmanaged cloud apps/services on your users' workstations - something that most organizations would launch a project for and do manual surveys and interviews with people. - If you're a large business, you'd need to invest in the paid options. Jussi was an expert in the field, and the examples he's used in the demos were quite interesting. such as detecting impossible travel activities from Netherlands to Bosnia and Herzegovina (cool country, been there on a rafting trip :)) and botnet attacks on Russi's tenants. Great session! - Connectors - nice use cases here. This topic was also covered by Maarten Eekels in one of the previous sessions. - Tabs - While those seem basic, they are reminding me of the Global Navigation in SharePoint. Wictor did a cool announcement of his new yo teams-tab tool which is basically scaffolding everything you need to start building your Tab for Microsoft Teams. Wictor asked everyone in the room to know TypeScript for the next time, as this was the future of SharePoint development. I trust him. He was helping me out of a good will with a customer project a few years back and I can say his wealth of knowledge is incredible. - Bots - those are based on the Microsoft Bot Framework and could do some pretty interesting stuff. During the workshops on Day 1, Vesa showed us how a bot is listening to commands via the iPhone's voice recognition and is creating a team site, based on the voice command. Pretty neat, huh? What an amazing session :) We were shown the Whac-an-MVP game created with PowerApps - LOL. - PowerApps is the successor, not the replacement for InfoPath. - Same is valid for Flow and SharePoint Designer workflows. - Use the cloud as much as possible, there aren't many valid alternatives for on-premise social. - Groups are the backbone of everything new in Office 365. 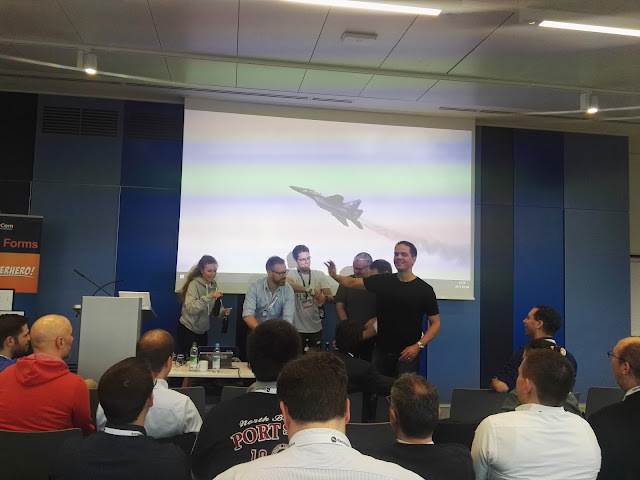 There was a raffle with some pretty cool prizes (Phantom 3 Drone, Xbox etc,) and then an official closing by Mathias with a group picture of the speakers. An epic way to spend the Saturday, I'd say! 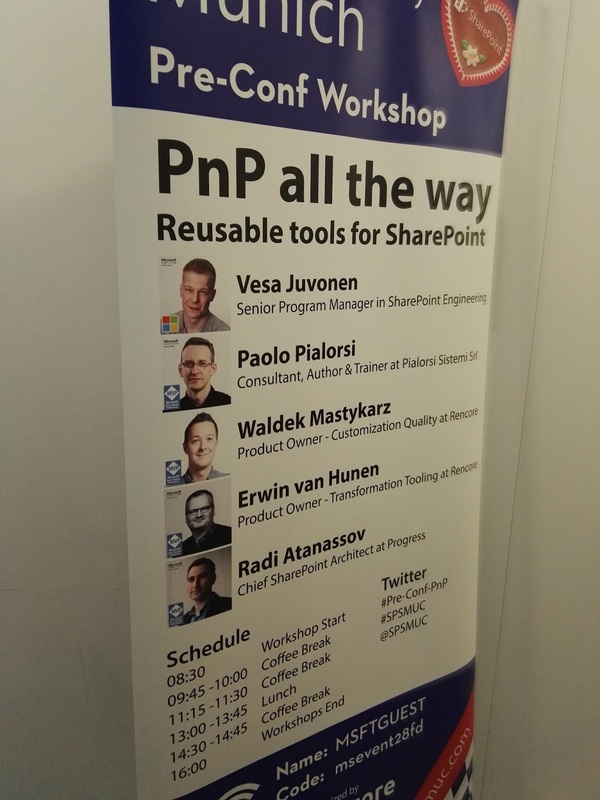 SharePINT :) Of course...looking forward for the next SharePoint Saturday! For the first time, I've аttended SharePoint Saturday Munich which was a massive community event, held directly at the Microsoft DE headquarters (awesome office, by the way). My friend and ex-colleague Alex Pavlov who is living and working in Munich and has been a part of the previous event in 2015 told me it was awesome and I should definitely go this year. So, I asked another buddy Ivan Yankulov, he thought it was a good idea and we formed the team. We've traveled the 1334 km (1:50 hours flight) to attend the free, community-organized SharePoint event and boy, I personally do not regret it! This Saturday, the organizers (the great team of Rencore AB) invested in setting up two full-day pre-conf workshops (paid - EUR 125 per workshop, limited to 50 seats each) on Friday, March 3rd. The workshop, targeted more to administrators was SharePoint 2016 Infrastructure Powerclass for Admins with Thomas Vochten. 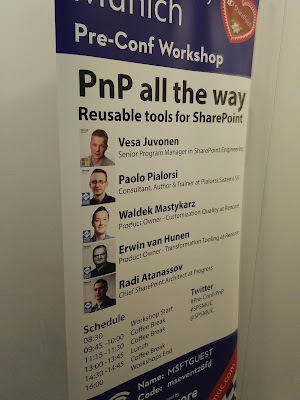 As I currently do not work with SharePoint 2016, I chose go to to: PnP all the way – Reusable tools for SharePoint with Vesa Juvonen, Erwin van Hunen, Paolo Pialorsi and last, but not least our friend from Bulgaria Radi Atanassov. Sounds funny, right? 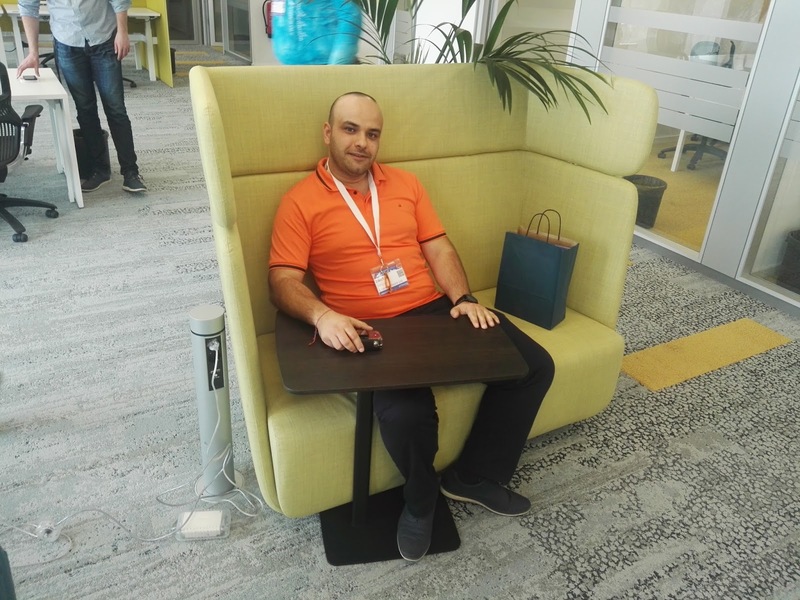 Going abroad to listen to a Bulgarian speaker - well, unfortunately in Bulgaria there's no SharePoint Saturday anymore and we (about 15-20 of us) only meet up in the SharePoint User Group Bulgaria once a month. 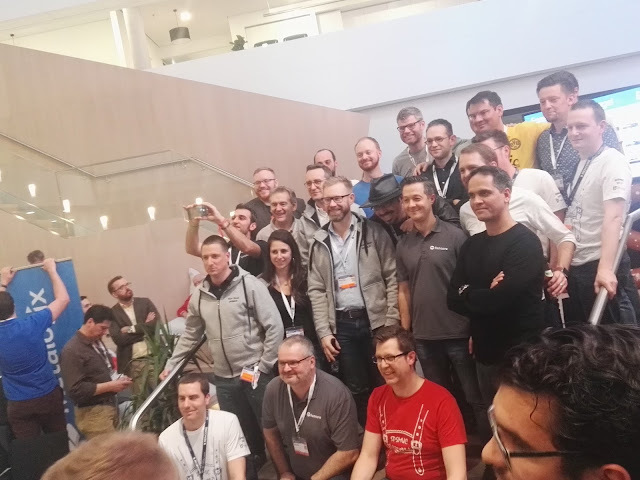 I believe it's a good idea to meet 400+ more SharePoint professionals from all around Europe (and even a few from US) so that we can catch up on the latest features, best practices and get aligned on the SharePoint future. And have a SharePint altogether, of course. I must admit I've missed the first tickets in December and I've booked my place on 9th of January, when the 2nd batch of tickets was released. I was refreshing the site a few times that day :) After I've registered, I got frequent communication over e-mail with updates on sessions, time, logistics etc. There was everything I needed to know so that I just showed up on the first day at 08:15 with my computer and tickets printed (later, I realized I didn't even needed the computer). So, here we are, flying out from Sofia, Bulgaria on Thursday, March 2nd around sunset time, just after wrapping up the work day. Our flight was delayed with half an hour, but check out what a view we've got in exchange for that. In the morning, we were at the Microsoft office 08:15 AM and the registration was already running full speed. Even though we couldn't get our badges on time, at 08:30 we were in the workshop rooms, with a cup of hot coffee (by the way the coffee that Microsoft treats their employees with was not bad at all). Our workshop was focused on everything PnP. I must confess I do not use that yet, but I am quite interested in starting to use it. I brought my laptop (and a few more people did) as I though we're actually going to use the samples and do something with them, but the day went more in a conference-like agenda. Anyway - happy with it, and I just gave PnP a try today so that I can create a solution that updates the SharePoint User Profiles (Delve in SPO) with data populated in a SharePoint list. For that purpose, I've used especially the PowerShell module on which Erwin van Hunen is working frequently. 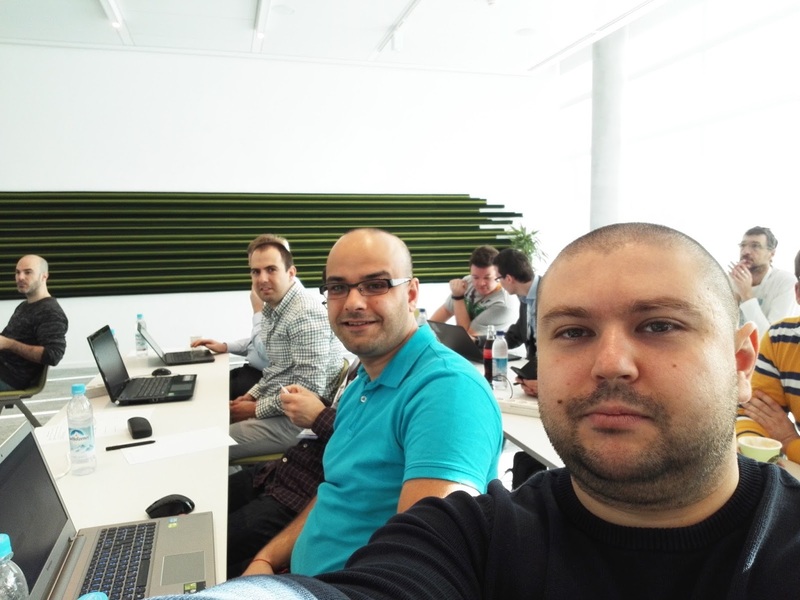 Here's a quick selfie of the Bulgarian team @ the workshop. Even though there was a small fee for the workshops, the whole event would not be possible without the support from the sponsors, so I'm including the slide with their names. Kudos to all those great companies! We've had lunch at the Microsoft canteen, and there were plenty of choices - some slow-roasted pork, pizza, pasta, sushi, soups, salads and freshly squeezed juices. Love it! 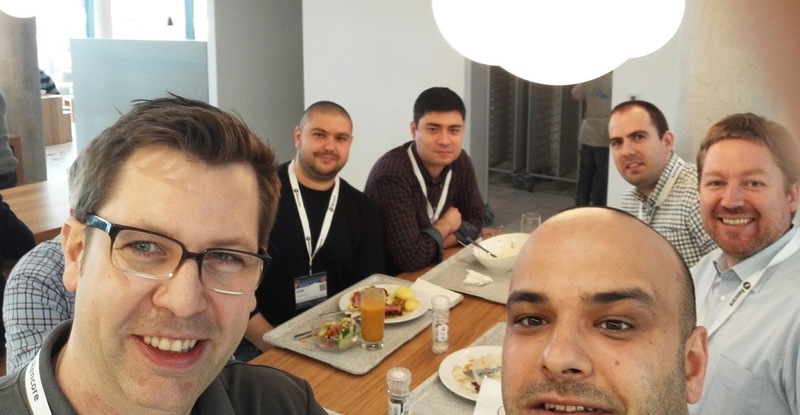 During our lunch, Mathias Einig (who's the main person to blame for SPS Munich and SPS Stockholm) came to ask if everything's going well and if we're happy with the workshops. Great attention to attendees! More info on Day 2 - the actual conference will come as part of the next blog post. 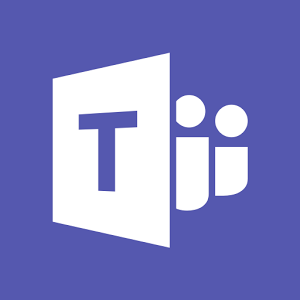 Will Teams take over collaboration from SharePoint? 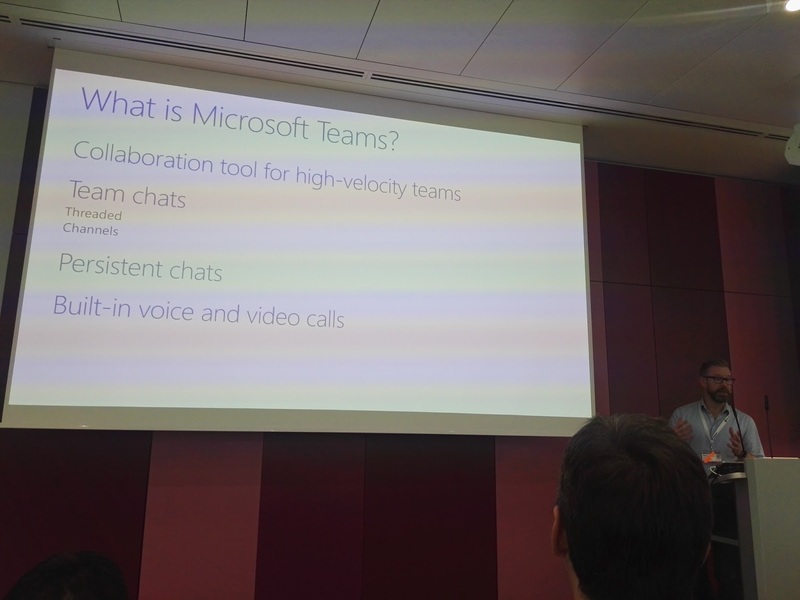 Already using Microsoft Teams? Do you like it or hate it already? 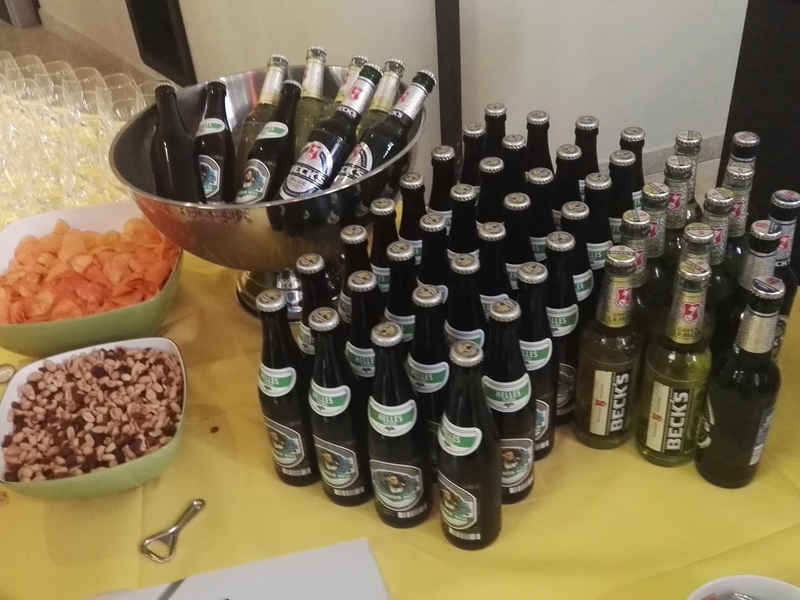 I've had a talk on the topic last week at the awesome SharePoint User Group Bulgaria meeting. You can find the video and the slides from the talk, I hope you enjoy them! Next week I'll be visiting SharePoint Saturday Munich where there will be a deeper level session led by Wictor Wilén on Teams and the customization available. I'll share some insights after the conference here, so stay tuned.